This is the most famous fried snack.. It is relatively quick and easy to make and is absolutely yummy..It is the best accompaniment with tea or coffee in the evenings.It is the excellent snack to prepare when sudden guests visit us. Mix all the flours, chilli powder, baking soda and salt with required quantity of water. The batter should't be too thick nor too thin. Dip the potato slice into the batter and slowly leave into the oil. Deep fry on both sides till they turn into beautiful golden yellow colour. Remove from heat and drain the oil on kitchen towel. 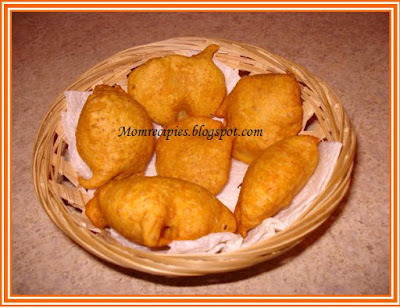 Now your yummy and delicious Aloo bajji is ready to serve. Serve hot with chutney, sauce or ketchup. pass me that plate na...want to hv tea n munch it. My all time fav..looks too prefect! Looks perfect and yummy dea..!!! These r my all time favourite.Look them pipping hot especially on rainy days. its my favorite.i suggest u that before preparing aloo bhaji u put aloo slice in hot water for few minuts. Wow...yummy snack, makes me droll. Looks delicious. its yummy. 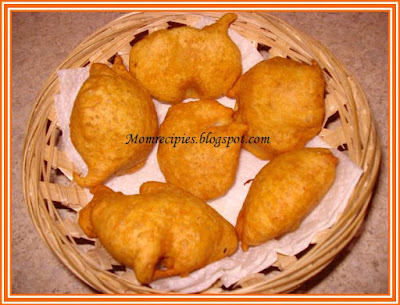 We can prepare the same kind of bajji using dates. I will definitely try preparing bajjis with dates.